Google Assistant is a virtual assistant that allows you to control your phone with voice commands. It can set appointments, send texts, and even play music from a variety of services. When Google Assistant won't play music, there could be a problem with the Google app, your linked Google account, or even the command that you're using to play music. When Google Assistant won't play music, it's usually an issue with the Google app, or a problem with a mismatch between the Google account you use for Google Assistant and the account you have tied to your music service. If you're having problems playing local music, you may be able to get it working by using a specific command. Verify that the Google app and your music service app have the necessary permissions. Make sure your Google Assistant device and music service account are linked to the same Google account. Try linking a new music service to your Google account. Set the correct default music service on your Google Assistant device. Include the phrase "in my library" in your request when attempting to play music that's stored on your device. Create a playlist of locally stored music, and ask Google Assistant to play that. Google Assistant relies on the Google app to work, so it will malfunction if your Google app doesn't have the necessary permissions. On an Android phone, permissions allow you to choose which parts of your phone individual apps are able to access. The Google app needs access to the microphone to hear commands, and other permissions to perform various tasks. Revoking permissions from the Google app can prevent Google Assistant from playing music and carrying out other commands. Your music app, like Google Play Music, also needs some permissions to work. For example, if you want to play locally stored music files, you need to give the app storage permission. Open the Settings app, and tap Apps & permissions. If any of the sliders are slid to the left or grayed out, slide them to the right. Hit the back button until you return to the Apps & permissions screen. Then tap your music service app. For this example, we're using Google Play Music. Compatible music services include Google Play Music, Spotify, Pandora, TuneIn, iHeartRadio, and YouTube Music. Make sure that the app has storage permission if you want it to be able to access locally stored music files. Check to see if Google Assistant is able to play music. Some music service apps, like Google Play Music, require your Google Assistant and the music app to both be tied to the same Google account. If you use multiple Google accounts for any reason, a mismatch here can prevent Google Assistant from playing music. This same basic problem can also cause problems with Google Home. If you're having this problem with Google Home, try linking your music accounts, like Spotify, from within the Google Home app on your phone. Open the Google app, and tap the More menu. Depending on the versions of Android and the Google app you have installed, you may see ⋮ More, ☰ More, or just More. Check the Google account at the top of this screen. Your music service app needs to be linked to this same Google account. If you need to switch which Google account is used by Google Assistant, tap the down arrow. Tap the account that you want to use with Google Assistant. The account you select has to be the same Google account that you link to your music service accounts. If you don't see the required account, tap + Add account and follow the on-screen prompts to add a new Google account to your device. Open your music service app. For this example, we'll use Google Play Music. To proceed, tap the ☰ (three vertical lines) icon. Your current account will be displayed in the top left corner of the screen, and user icons associated with additional accounts will be displayed to the right of that. If the incorrect Google account is selected, tap the correct account. Repeat this process for each music service app that you use. The next step is to try linking a new music account to your Google Assistant. There's a chance that you could have a problem with your Google Play Music app or account, and linking a new music account can help you figure that out. If Google Assistant is able to play music with the newly linked service, then double check that you're using the same Google account in both Google Assistant and Google Play Music. If you are, try uninstalling and reinstalling Google Play Music, or whichever music streaming app is giving you problems. Tap the link icon next to a music service like Spotify. Services like Pandora and Spotify have both free and premium versions. If you don't have a subscription to any of these services, create a free account and then link it using these instructions. If you've never logged into Spotify on your device, you may need to download and log into the Spotify app during this step. Repeat the previous steps for each additional music service you want to link. You can play music from any linked service by specifying the service in your Google Assistant command. On this screen, you can select the default service to use if no other service is specified. Try selecting a different default service, like switching from Google Play Music to Spotify, and see if that allows Google Assistant to play music. Check to see if Google Assistant is able to play music from any of the newly linked services. 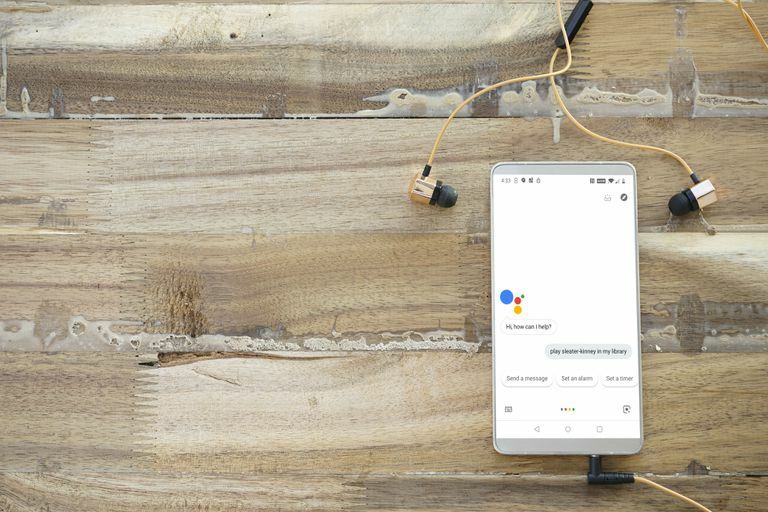 Google Assistant is designed to be able to play music from streaming services, like Google Play Music and Spotify, and offline music from local storage on your phone. If you're having trouble getting it to play music from your phone, it's important to specify "in my library" at the end of your command. For example, the command "Play Sleater-Kinney in my library" would cause Google Assistant to open locally stored songs from the band Sleater-Kinney using your default music app. In some cases, this doesn't work due to a problem with Google Assistant on specific devices. The best workaround is to create playlists, using your locally stored music files, and then ask Google Assistant to play one of these playlists. For example, you could create a playlist in Google Play Music using locally stored songs. You would then use the command "Play my playlist," replacing the word playlist with the actual name of a playlist that you have created. If Google Assistant still isn't able to play any of your locally stored files, you'll have to wait for Google to release a fix. You can visit the official Google Assistant support forum for additional information and to report your problem.